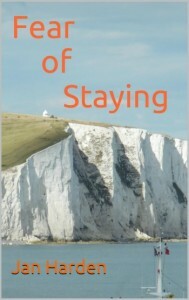 The following is a guest post by Jan Harden, author of Fear of Staying. If you would like to write a guest post on my blog, please send me an e-mail at contact@cecilesune.com. Many thanks to Cecile for giving me the opportunity to guest post on her great blog. To begin with, I will ask the obvious question: what’s an aging Australian man living in the southern Netherlands doing writing novels? In a working life which combined elements of anarchic nomadism with periods of reluctant responsibility, I cannot say it ever occurred to me to write. But then a couple of years ago I found myself working part time and driving backwards and forwards across Europe each month to spend time in the UK. If you grow up or live in most English speaking countries, Australia, New Zealand, the UK, and to a lesser extent the United States and Canada, one’s national identity is to some extent defined geographically by the mountains, oceans, seas, channels and rivers that separate and help define nations. In contrast, the physical boundaries of other nations are often far more fluid and ambiguous. Driving past the empty border posts of Europe, long since vacated by their guards and customs officials through the Schengen agreement, highlights just how fluid boundaries are. Although far from unique, one of the best examples of this is the small town of Baarle-Nassau in the Dutch province of Brabant. In an arrangement stemming from the Treaty of Maastricht of 1843, this little Dutch town contains 22 enclaves which are part of Belgium. Within these enclaves there are also smaller Dutch enclaves, cut off from the rest of the Netherlands. Negotiations over the fine tuning of boundaries were still going on in the late twentieth century. Unsurprisingly, up until the Benelux tax arrangements of the 1950s the primary activity of Baarle-Nassau was smuggling. Okay, I hear you ask, what has this got to do with writing? Whether driving across Europe, boarding buses in shadowy Latin American towns, or rattling across the steppe or the veldt in ancient trains, I am always struck by the ambiguity of borders. Briefly glimpsed signposts are like half open curtains in dimly lit windows, each gives a fleeting hint of what lies beyond. That is why I write. It is a way of following my curiosity about what lies behind and about the ambiguous overlap between entities, whether they be nations, cultures or people, which define themselves as different. Apparently, there is greater genetic variation between two bands of chimpanzees living a couple of kilometres apart from each other across a Congolese valley than there is in the whole of the human race. Yet all we seem to notice are the differences rather than similarities in people, nations and cultures. As I was travelling, I found myself being drawn to the narratives created by others to explain the ambiguities of differences and I, in turn, created my own narratives. Those narratives became stories and, eventually, novels. So I write as a way of exploring the world and either explaining it to myself or accepting the inexplicability of existence. Sure, I have probably learned a little about writing along the way; I think I’m on top of apostrophes by now and I’m giving Oxford commas a run for their money. I may even have learnt to put together something approximating a plot, construct some half-convincing dialogue and introduce a little dramatic tension. However, whatever I do it is but a vehicle for me to explore the ambiguities which surround us. So I know why I write what I write. I guess the next step is to get a handle on why people read (or don’t read) what I write. About the author and his work: Jan Harden’s Blog.